I’ve been meaning to write this post up for a really long time but, obviously, life just kept getting in the way. So apologies, I know I’ve been promising it for a while! Back in March, when the weather was still cold and dreary in London, I hopped over to Marrakech for a few days with my “sort-of cousin” Allison who had just turned 21 and was taking a little holiday around Europe to celebrate. I wasn’t supposed to go with her but last minute her friend had to drop out and so I slipped into her place – rather happily, I might add! The trip was lovely, it was wonderful to spend some time with Allison who was heading back to the States shortly (she was only in London to study for a semester) and Marrakech itself was great fun… but three days was enough! You see, as beautiful as it was, there were times when Allison and I were downright terrified to be two young ladies in a foreign country by ourselves. Allison’s French is non-existent and my French is only at GCSE level and hidden beneath years of Spanish (a language I have always found to be much more intuitive), which meant that we were mostly relying on me to fumble my way through misconjugated verbs and wild gestures. By day three I was managing to communicate – my proudest moment was having a conversation with a stall vendor in the souks about traditional Moroccan sweets and where I could find them – but there were times when we thought we were going to either be run over by the ridiculous traffic or mugged down a dark alleyway by gangs of children. So here’s my guide to Marrakech – we really only scratched the surface and if I were ever to return I’d probably want to go with a male companion, not ever by myself or with another girl. 1. 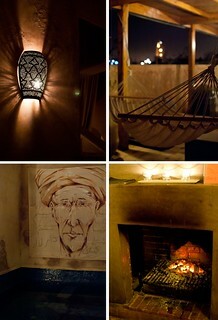 …stay in a riad near the medina. Marrakech is small and, because of the particular deal on our trip, we ended up staying in a beautiful hotel called The Marrakech Ryads Parc & Spa. 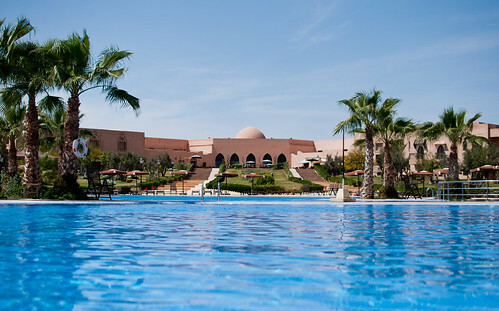 Whilst it was a lovely hotel (the two pools, in particular, were spectacular), the staff very friendly and the buffet-style food delicious, what we didn’t know was that it was primarily a French-speaking hotel and literally miles away from the medina. 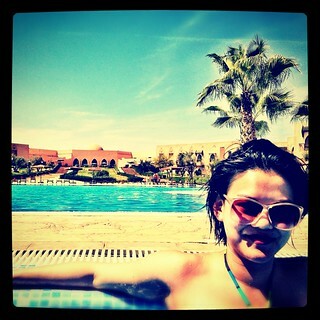 In fact, it was almost closer to Casablanca than Marrakech (here’s lookin’ at you, kid). If you’re looking for a do-nothing-sunbathe holiday then fine, but if you want to explore Marrakech then stay in the centre of it! 2. …change your money initially in the medina but back again in the airport. Because Moroccan dirhams are a closed currency, that means you can only change it within the country. We actually found that, though you may be tempted to change your money at the airport immediately, you should only change enough for a taxi to your riad/hotel, then change the rest in the medina at one of the many bureau de change booths – you’ll get a much better rate! The pound has extremely high value so you’ll end up walking away with a lot of dirhams. On a side-note, be prepared to queue at customs for a long time. You have to fill out a white landing card when you enter and again another when you leave the country – you may as well do it in the queue. You won’t understand why it’s taking quite so long to get through but if there are any Moroccan dignitaries around (with red passports; regular people have green ones) they’ll be hurried to the front and you’ll have to wait a little longer still. Everybody gets through eventually, it just takes a ridiculous amount of time! 3. …barter, barter, barter, then barter some more. 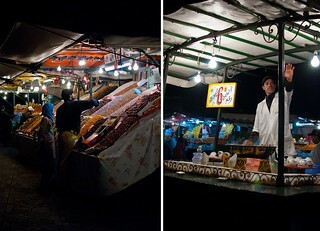 The saddest thing about Marrakech was that I constantly felt like I was being ripped off. When we first took a petit taxi (the yellow ones) from the airport to our hotel, we paid a ridiculous amount of money and didn’t question it or try to barter for a lower price. In fact, we probably paid twice as much as you would normally and, sadly, many people will push their luck and not be very honest, saying that the meter doesn’t work, then charging you an arm and a leg. So do barter – barter with the taxi drivers and the vendors and if you still don’t like the price, walk away – there are plenty more taxis and plenty more vendors who will give you a better one. 4. …brush up on your French and be polite and friendly. Though English is spoken by most people, if you speak a little French you will be amazed at how much more friendly and accommodating people are. At least brush up on your greetings – a ‘salut’ or ‘bonjour’ over ‘hello’ will be much better received (and if you’re strolling through the medina looking for souvenirs, probably a better price!). We met a lot of really lovely people who were friendly, open and eager to help – unfortunately they’ve all blended into one as they were all either named Mohammed or Abdul! But we were very grateful to all of them as just when we were starting to grow weary of Morocco, some kind soul would pop up and make us smile again. This proved invaluable. It is so easy to get lost in the maze of the souks and, luckily, I’d found a fairly decent map at the airport before we left London which was, amazingly, labelled with all of the side streets and twists and turns. However, at one point we found ourselves ridiculously and hopelessly lost in the centre and despite poring over our map for a good half hour (and with the help of a lovely Belgian couple), we still had no idea where we were. We had to be back at a meeting point at a specific time, due to some confusion on the hotel’s part about what time we wanted to return that day (the hotel had a free shuttle bus which saved us a lot of money on cab trips but departure times were very specific) and at this rate it looked like we were never going to make it out in time. Feeling like I was on the verge of tears and desperately looking around for anything that looked familiar, I finally remembered that my iPhone had a compass and so I pulled it out and headed West doggedly, Allison in tow. Within ten minutes we were out of the maze, back on the main road and heading to our meeting point. Bring a compass – you won’t regret it. 1. …bother haggling over 5 or 10DH. By the end of our trip we were much better at bartering but had one bad experience where the vendor got very upset with us because we’d pushed it a little too far over a mere 5DH. The lesson here is that though it’s fine to haggle over 100DH or more, around the 15 to 25 mark don’t bother – if you think about it that’s just under £2, nothing for us tourists with our flashy clothes and oodles of money, but for the locals that’s enough for a whole meal. Morocco is an Islamic country. Whilst that doesn’t mean that you need to wear a djellaba or hijab, it does mean that if you want to attract as little attention as possible and avoid dirty looks from the locals, you should cover up. More than anything, it’s a matter of respect – you wouldn’t go to a temple in ripped jean-shorts and flip-flops, don’t walk around Marrakech in little more than a bikini, no matter how hot it is. 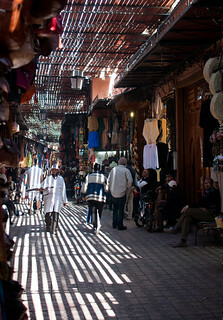 You wouldn’t believe how many Westerners we saw wandering around Marrakech wearing tiny little shorts or low-cut tops and vests – even I felt a little offended for the locals. For women I suggest bringing and wearing long, loose cotton skirts or trousers and loose, long-sleeved tops and shirts. If you don’t have any appropriate tops, cover up with a loose cardigan. Long scarves and pashminas are so useful – I ended up wearing my scarf as cover up for my chest when my tops were a little low – not low enough to be falling out, mind, just enough to make me feel uncomfortable and worried about cat-calls or dirty looks. Bring good, comfortable shoes for walking and leave the heels at home – you’ll walk a lot and in the souks the ground can be uneven and cobbled. Just don’t bother with the heels, your feet will thank me later. 3. …take photos of people without asking. There were signs all over the place declaring, ‘no photos’ and every time I raised my camera somebody would hold their hand up and shoot me a dirty look. I found one crudely scrawled cardboard sign in the medina which read, “to take photos of somebody without even asking is so very rude”. 4. …worry about crossing the road. When you get to Marrakech the first thing you’ll notice is the insane traffic. There seem to be no rules as mopeds, motorbikes, cars and push bikes weave in and out, horns blaring and drivers yelling at each other in Arabic. How, you may wonder, does one cross the road in such disorder? The answer is, apparently, to just be confident and go – traffic will stop for you. It took a little getting used to, and for the first couple of days I would simply grab Allison’s arm and run, muttering, “please-don’t-let-me-die-please-don’t-let-me-die” under my breath, but actually drivers will stop, even if they do shoot you a bit of a weary look first. 5. …waste your money on tourist trap eateries. There is so much good food to be had in Marrakech but it’s very easy to fall into that trap of finding the nearest tourist joint and just deciding that you’re too tired to find anywhere else. Do a little research and plan where you want to eat – we only really planned one meal and stumbled upon the rest and I wish we’d spent a little more time seeking out the best of the best. This little cafe is set across three floors and boasts a rooftop terrace with a beautiful view of the Atlas Mountains and Kedima Square, right in the heart of the souks – perfect for a leisurely lunch. 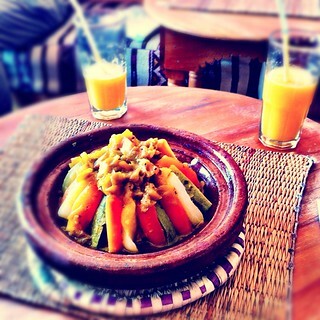 Their couscous aux sept legumes (7 vegetable couscous) was delicious and totally hit the spot for two hungry travellers! This restaurant was recommended to me by a friend and it ended up being simply perfect. If I ever return to Marrakech I would definitely stay at this riad – it’s a stunning, intimate location, tucked away down the back streets of the souks, right in the heart of the medina, and the food was fantastic. Run by a French previously Michelin starred chef who decided to pack it all in and move out to Marrakech, service is impeccable and friendly – our waiter even walked us back out to the main part of the souks, worried that we’d get lost and not know where we were going! We had our last meal of the trip here and it was the ideal end to our time in Marrakech. A bit of a hidden gem, you must book ahead. The main square in the medina, I wish we’d eaten here one night when it was buzzing and full of delicious sights and smells from the many food stalls. Snails are a great speciality and you’ll see many vendors stirring huge vats of them – make sure you get a glass of freshly squeezed orange juice (2DH max) but avoid the monkeys and snake charmers who will make you pay to take photos (and if the monkeys jump onto your clothes you may catch fleas!). 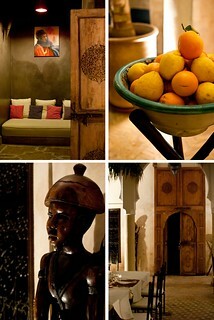 I’m not convinced that a hammam, a traditional Moroccan spa treatment, is all that necessary when in Marrakech. To be honest, it’s an interesting experience, but you just end up feeling a bit greasy and smelly and, personally, I went back to my hotel room after and had a long, hot shower to wash the oil out of my hair and off my body. Having said that, many people love them – do some research and find one you like the look of if you’re desperate to try it out. Do walk around and explore – the Palais de la Bahia (The Bahia Palace) is particularly beautiful (2DH to enter) and apparently there are storks, though the central part of the palace was closed on the day we visited so we didn’t get to see them. You can also visit certain mosques but many of them are working places of worship so you must cover your head and wear sensible clothing (which, if you’re reading this, you’re hopefully already planning to do!). The largest mosque in Marrakech, Koutoubia Mosque, is on the main road (Avenue Mohammed V) in the medina and broadcasts its worship hourly from huge speakers which penetrate into the souks. When it’s time for prayer all of the souk vendors turn off their own music, allowing those who wish to pray to hear the broadcast, which is somewhat tinny but incredibly loud. 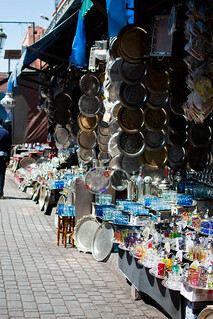 For souvenirs, visit the souks in the medina. Be aware that most things are overpriced and if you don’t like the price you’re being offered in one souk, another will have an identical item for much cheaper. Spend an entire day wandering around and allow time to get lost! If you’d rather not deal with bartering, the Centre Artisinal will have many of the same items you can find in the souks at a fixed price. You may pay a little more than you would in the souks but the men who work here are extremely kind and friendly and, if you allow them to help you, they may give you a discount (the gentleman who was helping us asked what we did and upon learning that we were a student and a writer gave us a huge discount because, in his words, we had “little money in those professions”!). If you have time, I’ve heard that a donkey ride into the Atlas Mountains is a great day trip. We unfortunately couldn’t make it out but everybody tells me that it’s a wonderful thing to do! 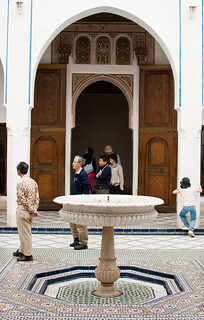 An interesting little bit of information I learned was that the shape of different archways signified Berber territory or Moroccan territory – traditional pointed arches were Moroccan but round arches were Berber. The Berber or amazigh (meaning: “free people”) are the indigenous nomadic peoples of North Africa, many of whom have now moved into the cities to live and trade. 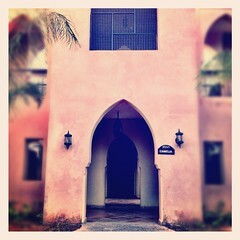 Keep an eye out and you’ll notice plenty of differing archways! Something that you may not know about Morocco is that the government have a very strict policy on issuing passports, which means that many people are a little desperate to get out of the country. This may explain the fascination with Western women – marrying a Westerner could mean an escape for many people. When I learned this on my final day I was overcome with a sense of sadness and guilt, guilt for the way that we often take for granted the opportunities afforded to us in the West and also for my own irritation at being hounded constantly over the time we were in Marrakech, but I also had a much better understanding for the country and the people. It was a bit of a shock realisation but, I believe, very necessary. 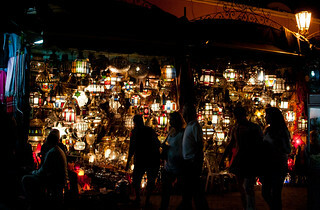 PS: See more photos in my Marrakech set on Flickr. I absolutely love this post! 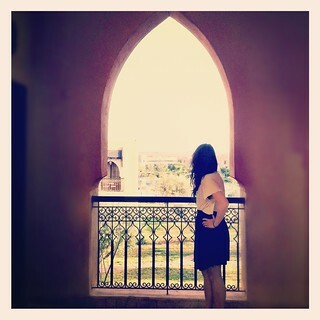 You’ve reminded me of all the great moments we shared in Marrakech. The positive experiences certainly overshadowed the bad, even though we were frustrated and annoyed at times. You were the most fun travel companion, and I hope we get another chance to tour around together in the future! Have you used your Moroccan tea glasses yet? I brewed some for my family, making sure I added plenty of sugar. They loved it! Looks very beautiful and exotic. 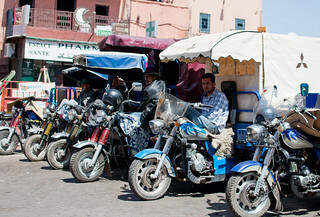 Great tips for those of us who may one day have the chance to *hop over* to Marrakech. Looks like an epic holiday. And fun too! Thanks for this – loved it! I’m now planning a trip there!